When you go to a friend’s exhibition opening after a long teaching afternoon and you unexpectedly end up playing “Syrinx”. Please visit “Paradise” by Enric Llevat at it’s really worth! Paradise d’Enric Llevat at Cooperativa Obrera – Teatre el Magatzem. Aquí is dejo el enlace a los comentarios firmados por Luis Suárez sobre el CD “Flute Spirit”. Gracias Luis por tu interés en mi trabajo! Gràcies de tot cor a tots els qui ahir em vàreu acompanyar en la presentació del meu primer disc en solitari: “Flute Spirit”. Va ser un èxit! 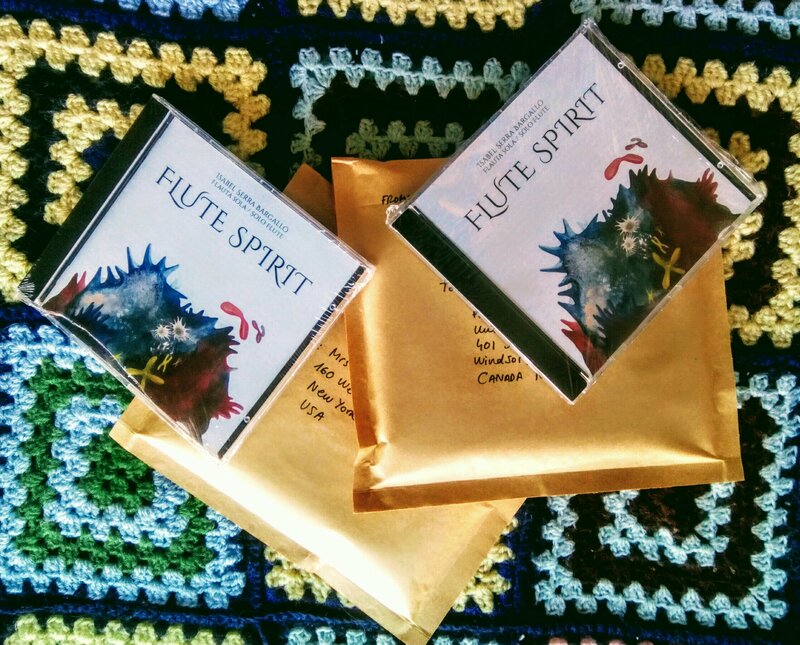 FLUTE SPIRIT is already flying to USA and Canada. Official presentaton in my city, Tarragona, on sunday 12th november. Very happy! The sound of the flute flows from within the body towards the instrument and from the instrument to the outside. The air vibrates inside the tube moved by the breath and produces the sound. The breath is moved by the inner energy: chi for the Chinese, prana for the Hindus. So the sound is moved by energy and arises from the breath, an essential life factor together with the heartbeat. Both respond to an alternation, to a cyclical rhythm of expansion and contraction, fullness and emptiness. Everything responds to cycles in Nature: day and night, the passage of the seasons, wet times and droughts… The human being responds to cycles in the same way as the rest of the universe does. The entire universe is within the human being, as we also find it symbolically in music. All the multiplicity of musical notes develops from sound. The range of tones, their variety in pitch, color, dynamics and articulation represents the diversity of all that is manifested. This record contains a selection of pieces for solo flute which I have been incorporating throughout my life cycle. Each one has a special meaning for me. Some of the pieces are well known, and I studied and played them in exams and competitions at the beginning of my career; others were dedicated to me or composed for me more recently. There are pieces that evoke the sound of wind instruments from traditional cultures, such as Japanese bamboo flutes or Native American flutes. There are also pieces of Oriental inspiration, more spiritual. As a whole, the repertoire on this CD is related to what playing the flute means to me — an experience in which I become conscious of life without thinking about it. I recorded in a meditative state, and that is what I would like to transmit to the listener. Image, op. 38 (1939) by Eugène Bozza is a fresh, lively and sparkling piece, like spring. It was one of the first solo flute compositions I learned and has been with me since my youth. It represents a starting point, and that is why I chose it to open this record. From the alternation of origins and the present comes the situation in the second place of two pieces by the Canadian composer Jonathan G. Bayley: …From Within (1981) and Music for Pan (1976). In the late 1970s and early 1980s Bayley studied at the Banff Centre for Arts and Creativity (Banff, Alberta, Canada) and it was the jazz flutist Paul Horn who introduced him to the alto flute. The first of the pieces seeks an inner sound, integrated with the breathing, and the second one, dedicated to Jeanne Baxtresser, shows Baroque reminiscences in its form and articulation, while alluding to the mythological legend of Pan and Syrinx, so closely linked to the flute repertoire. Benjamin Britten composed his Six Metamorphoses after Ovid, op. 49 (1951) for solo oboe inspired by various Greek and Roman mythological figures. Pan belongs to this set of pieces and I decided to play the flute version in 2013 as a tribute to the 100th anniversary of the composer’s birth. I like to play this piece along with the famous Syrinx (1913) by Claude Debussy. I look for the harmonic richness of a double reed instrument in Britten, and the sonority characteristic of the Pan flute, or syrinx, in Debussy. Toru Takemitsu deeply loved the flute and the alto flute and they played a prominent role in his works. Air (1995) represents the heritage of Debussy’s impressionistic style. It was dedicated to Aurèle Nicolet, a leading flute player who passed away in 2016, as a birthday present, and is the last piece the Japanese composer wrote shortly before his own death. In the ancient tradition of Japan it was believed that the sound of the flute could reach the souls of the dead; breathing into the flute made it possible to communicate, through sound, with something beyond. Kazuo Fukushima imbues his music with a strong influence of ancestral Japanese culture and philosophy, which is evident in the sonorities and meaning of his Requiem (1956). Other ancestral sonorities, this time from Native North American music, can also be heard in Kokopeli (1990), by Katherine Hoover. I personally met the composer in 2012. I worked on this piece with her and later played it at a lecture she gave at the Barcelona Liceu Conservatory on February 29th of the same year. Kokopeli the flute player was a great mahu, a legendary hero of the Hopi. He is said to have led the migration of his people through the Southwest, the sound of his flute echoing through canyons, valleys and mountains. The piece captures this sense of spaciousness and the strong connection the Hopis felt to the land. Another composer I have had the pleasure of working with is Marian Marquez, who dedicated Abril (2016) to me. I premiered this piece in the summer of 2016 in a concert that was part of the Bouquet Music Festival in Tarragona. The piece evokes sunrise, the song of birds, some insects, the wind, the brightness of midday, the rain and more, describing much of what Nature brings us in this month of the year. My collaboration with the composer Conrad Setó is reflected on this record through two of his pieces. The first of them, Narració (2010), was written originally for a Catalan folk wind instrument called the gralla. The score inspired me to experiment with the alto flute and I decided to make my own version of it, resulting in a very different sound. The second piece, Poema-Raga (2017), for solo flute and electronics, is a new composition written especially for me. Working directly with the composer and being present throughout the creative process was a new and enriching experience that opened new paths to the future. El sonido de la flauta fluye desde el interior del cuerpo humano hacia el instrumento y del instrumento hacia el exterior. El aire vibra en el tubo movido por el aliento y produce el sonido. Al aliento lo mueve la energía interior: chi para los chinos o prana para los hindús. Así pues, al sonido lo anima la energía y surge de la respiración, un factor vital junto con el latido del corazón. Los dos responden a una alternancia, a un ritmo cíclico de expansión-contracción, de lleno-vacío. En la naturaleza todo responde también a ciclos: el día y la noche, el paso de las estaciones, las épocas húmedas y las épocas de sequía… El ser humano responde a ciclos tal como lo hace el resto del universo. Tiene dentro suyo el universo entero, así como también lo encontramos simbólicamente en la música. A partir de la base del sonido se desarrollará toda la multiplicidad de notas musicales. La gama de notas, su variedad tanto por altura, color, dinámica o articulación, representa la diversidad de todo lo manifestado. Este disco contiene una selección de piezas para flauta sola que he ido incorporando a lo largo de mi ciclo vital. Cada una tiene un significado especial para mí, desde las obras más habituales que estudié y presenté a exámenes y concursos al principio de mi carrera hasta otras que me han dedicado o han sido escritas para mi en la etapa más reciente. Otras piezas me transportan al sonido de las flautas de bambú japonesas o la flauta de los nativos americanos, propias de culturas tradicionales. También las hay de inspiración oriental, espiritual. En todo caso, el contenido de este disco está relacionado con lo que para mí significa tocar la flauta: una experiencia en la cual tomo consciencia de la vida sin pensar en ella. He grabado en estado meditativo y eso es lo que me gustaría transmitir en la escucha. Image, op. 38 (1939), de Eugène Bozza, es una obra fresca, de carácter primaveral, viva y chispeante, de las primeras que introduje en mi repertorio para flauta sola y que me ha acompañado desde la juventud. Representa un punto de partida y por eso la he escogido para abrir el disco. De la alternancia de origen y presente surge la situación en segundo lugar de las dos piezas del canadiense Jonathan G. Bayley: …From Within (1981) y Music for Pan (1976). A finales de los años 70 y principios de los 80 del siglo pasado el flautista de jazz Paul Horn presentó la flauta en sol al compositor, que se encontraba estudiando en el Banff Center for the Arts de Alberta. La primera pieza busca un sonido interior, integrado con la respiración, mientras que en la segunda, dedicada a Jeanne Baxtresser, destaca la forma y articulación de reminiscencias barrocas a la vez que remite a la leyenda mitológica de Pan y Syrinx, tan ligada al repertorio para flauta. Benjamin Britten compuso sus 6 Metamorfosis según Ovidio, op. 49 (1951) para oboe solo inspirándose en diversos personajes de la mitología grecoromana. Pan forma parte de este grupo de piezas y decidí hacer la versión para flauta en 2013 en homenaje al centenario del nacimiento del compositor. Me gusta tocar esta obra al lado de la célebre Syrinx (1913) de Claude Debussy. Así como en Britten busco la riqueza en armónicos de un instrumento de doble caña, Debussy requiere de la flauta travesera el carácter propio de la flauta de Pan o siringa. Toru Takemitsu amó profundamente la flauta y la flauta en sol, a las que dio un papel destacado dentro de su obra. De herencia impresionista y debussyniana, dedicó Air (1995) a Aurèle Nicolet, importante flautista desaparecido en 2016, como regalo de cumpleaños. Es, además, la última obra del compositor japonés poco antes de su propia muerte. Según la antigua tradición del Japón, se creía que el sonido de la flauta podía llegar a las almas de los difuntos; dirigir el aliento a la flauta posibilitaba comunicarse, a través del sonido, con algo superior. Kazuo Fukushima presenta una fuerte influencia de la cultura y la filosofía ancestrales de su país en su música, como se hace evidente con las sonoridades y el significado de Requiem (1956). Otras sonoridades ancestrales, esta vez procedentes de las tribus nativas norteamericanas, se escuchan también en Kokopeli (1990) de Katherine Hoover. Conocí personalmente a la compositora en el año 2012, trabajé con ella esta pieza y la interpreté en directo en la conferencia que ofreció el 29 de febrero de ese mismo año en el Conservatorio del Liceo de Barcelona. Kokopeli fue un héroe legendario de la tribu de los Hopi, que condujo a la migración de su pueblo a través de los cañones, los valles y las montañas gracias a los ecos que producía el sonido de su flauta. La pieza captura esta sensación de amplitud en el espacio y el estado de conexión con la tierra propias de los nativos. Otra compositora con quien he tenido el placer de trabajar es Marian Marquez, que me dedicó Abril (2016). Estrené la obra en verano de 2016 dentro del Bouquet Festival de Tarragona. La pieza evoca la salida del sol, el canto de diversos pájaros, algún insecto, el viento, la plenitud del mediodía, la lluvia…, y describe mucho de lo que nos trae la naturaleza en este mes del año. La colaboración con el compositor Conrad Setó queda reflejada en este disco a través de la grabación de dos de sus obras. La primera de ellas, Narració (2010), fue escrita originalmente para un instrumento popular catalán: la gralla. La partitura me sugirió la posibilidad de experimentar con la flauta en sol y hacer con ella una versión personal con un resultado sonoro bastante diferente. La segunda obra Poema-Raga (2017), para flauta sola y electrónica, es de nueva composición, especialmente escrita para mí. Trabajar al lado del compositor y estar presente en el proceso de creación ha sido una experiencia nueva muy enriquecedora, que abre caminos hacia el futuro. El so de la flauta flueix de l’interior del cos humà cap a l’instrument i de l’instrument cap a l’exterior. L’aire vibra dins el tub mogut per l’alè i produeix el so. L’alè el mou l’energia interior, chi per als xinesos o prana per als hindús. Així doncs, el so l’anima l’energia i sorgeix de la respiració, un factor vital conjuntament amb el batec del cor. Tots dos responen a una alternança, a un ritme cíclic d’expansió-contracció, de ple-buit. En la natura tot respon també a cicles: el dia i la nit, el pas de les estacions, les èpoques humides i les èpoques de sequera… L’ésser humà respon a cicles tal com ho fa la resta de l’univers. Té dintre de seu l’univers sencer, així com també el trobem simbòlicament en la música. A partir de la base del so es desenvoluparà tota la multiplicitat de notes musicals. La gamma de notes, la seva varietat tant per alçada, color, dinàmica o articulació, representa la diversitat de tot allò que és manifestat. Aquest disc conté una selecció de peces per a flauta sola que he anat incorporant al llarg del meu cicle vital. Cadascuna té un significat especial per a mi, des de les obres més habituals que vaig estudiar i portar a exàmens i concursos al principi de la meva carrera fins a d’altres que m’han estat dedicades o han estat escrites per a mi en l’etapa més recent. D’altres peces em transporten al so de les flautes de bambú japoneses o la flauta dels natius americans, pròpies de cultures tradicionals. També n’hi ha d’inspiració oriental, espiritual. En tot cas, el contingut d’aquest disc està relacionat amb el que per a mi significa tocar la flauta: una experiència en la qual prenc consciència de la vida sense pensar en ella. He gravat en estat meditatiu, i això és el que m’agradaria transmetre en l’escolta. Image, op. 38 (1939), d’Eugène Bozza, és una obra fresca, de caràcter primaveral, viva i espurnejant, de les primeres que vaig introduir en el meu repertori de flauta sola i que m’ha acompanyat des de la joventut. Representa un punt de partida i per això l’he escollit per obrir el disc. De l’alternança d’origen i present sorgeix la situació en segon lloc de les dues peces del canadenc Jonathan G. Bayley: … From Within (1981) i Music for Pan (1976). A la darreria dels anys 70 i principis dels 80 del segle passat el flautista de jazz Paul Horn va presentar la flauta en sol al compositor, que es trobava estudiant al Banff Centre for the Arts d’Alberta. La primera peça busca un so interior, integrat amb la respiració, mentre que en la segona, dedicada a Jeanne Baxtresser, destaca la forma i l’articulació de reminiscències barroques alhora que remet a la llegenda mitològica de Pan i Syrinx, tan lligada al repertori per a flauta. Benjamin Britten va compondre les seves Sis metamorfosis segons Ovidi, op. 49 (1951) per a oboè sol inspirant-se en diversos personatges de la mitologia grecoromana. Pan forma part d’aquest grup de peces i vaig decidir fer-ne la versió per a flauta l’any 2013, en homenatge al centenari del naixement del compositor. M’agrada tocar aquesta obra al costat de la cèlebre Syrinx (1913) de Claude Debussy. Així com en Britten busco la riquesa en harmònics d’un instrument de doble canya, Debussy demana de la flauta travessera el caràcter propi de la flauta de Pan o siringa. Toru Takemitsu estimà profundament la flauta i la flauta en sol, a les quals va donar un rellevant paper dintre de la seva obra. D’herència impressionista i debussyniana, va dedicar Air (1995) a Aurèle Nicolet, important flautista desaparegut el 2016, com a regal d’aniversari. És, a més, l’última obra del compositor japonès poc abans de la seva pròpia mort. Segons l’antiga tradició del Japó, es creia que el so de la flauta podia arribar a les ànimes dels difunts; dirigir l’alè dins de la flauta possibilitava comunicar-se, a través del so, amb quelcom superior. Kazuo Fukushima presenta una forta influència de la cultura i la filosofia ancestrals del seu país en la seva música, com es fa evident amb les sonoritats i el significat de Requiem (1956). Altres sonoritats ancestrals, aquest cop procedents de les tribus natives nord-americanes, s’escolten també a Kokopeli (1990), de Katherine Hoover. Vaig conèixer personalment la compositora l’any 2012, vaig treballar amb ella aquesta peça i la vaig interpretar en directe en la conferència que va oferir el 29 de febrer d’aquell mateix any al Conservatori del Liceu de Barcelona. Kokopeli fou un heroi llegendari de la tribu dels Hopi, que va conduir la migració del seu poble a través dels canyons, les valls i les muntanyes gràcies als ecos que produïa el so de la seva flauta. La peça captura aquesta sensació d’amplitud en l’espai i l’estat de connexió amb la terra propis del natius. Una altra compositora amb qui he tingut el plaer de treballar és Marian Marquez, la qual va dedicar-me Abril (2016). Vaig estrenar l’obra l’estiu de 2016 dintre del Bouquet Festival de Tarragona. La peça evoca la sortida del sol, el cant de diversos ocells, algun insecte, el vent, la plenitud del migdia, la pluja…, i descriu molt del que ens porta la natura en aquest mes de l’any. La col·laboració amb el compositor Conrad Setó queda reflectida en aquest disc a través de l’enregistrament de dues de les seves obres. La primera d’elles, Narració (2010), fou escrita originalment per a gralla. La partitura em va suggerir la possibilitat d’experimentar amb la flauta en sol i de fer-ne una versió personal amb un resultat sonor força diferent. La segona obra, Poema-Raga (2017), per a flauta sola i electrònica, és de nova composició, especialment escrita per a mi. Treballar al costat del compositor i estar present durant el procés de creació ha estat una experiència nova molt enriquidora, que obre camins al futur. Solo flute CD “Flute Spirit” new release presentation: Tots convidats! / Todos invitados! / All invited! Esteu tots convidats a la propera presentació del disc FLUTE SPIRIT, amb obres per a flauta sola i flauta en sol sola d’ E. Bozza, J. Bayley, B. Britten, C. Debussy, T. Takemitsu, K. Fukushima, K. Hoover, M. Marquez i C. Setó, interpretades per Isabel Serra Bargalló. El 12 de novembre a les 12 h, al Museu d’Art Modern de la Diputació de Tarragona.